Midweek the minivan (our small car) broke down. Well, technically it kept moving but it wouldn’t shift out of first gear while Coach tried to drive it to work. Better him than me. This transmission issue set us back a piddly $1,200. Life with 4 drivers and 2 cars was challenging. It was going to take 3 excruciating days to be fixed. Our chaos ramped up a notch. After orchestrating who was getting who where and picked up when with limited wheels, I raced off to drop Mini at dancing class at 5:35. In case you have lost track - it was Thursday, the night of Curly's 4th grade program. Curly skipped her music program last year in order to attend dancing class. This year the school gave her one of the main parts in the program, so she opted to miss her pricey, pre-paid Irish dancing class to perform with her class. This all-I-wanna-do-is-dance kid spent a few weeks in a boot with a hurt foot several weeks ago. Too bad her school performance didn't land a few weeks ago when she couldn't' dance anyway? Sigh. As I left with Mini, I reminded everyone that when Lad returned from picking up Reg from basketball practice, he or Eddie had to run Curly over to the school by 6:30. Curly had showered and was eating dinner when I left. Showtime was 7. I would stop home after dancing and pick up anyone who wanted to go to the show. Traffic was unbearable. There was a four car rear ending type accident in the far right lane ADJACENT TO US. I thanked my lucky starts that I had gone to the left when I passed a slow truck in the center lane. Oh how I hate the sound of cars crashing and splitting metal. When I got home, the entire kitchen smelled BAD. Really bad. Eddie was eating and yelling at Reg between bites. ‘Tell him he has to shower before he goes to the show!’ Ed begged. It was Reggie’s feet. Reg wasn’t convinced his presence was necessary at the show. I informed him that playing games on his school-issued lap top at home wasn’t an option. ‘TAKE A SHOWER NOW! Ed and I are leaving soon. You come in a few minutes with Lad. I wanted as many live bodies to attend this shin-dig as possible. Curly was bummed that Coach couldn’t go. Not many classmates have college and high school aged brothers, so I figured if she was surrounded by several 6 foot plus guys she would feel like a big deal. 'Lad, don’t be late! (I yelled that part upstairs)’ and Ed and I shuffled to the car. I literally bumped into Tank in the garage. He had just cut someone’s lawn. ‘Hop in! You can come to Curly’s show,’ I ordered. Ed winced. He wanted Tank to stay home and shower. Tank was sweaty from mowing. Tank home alone is never a productive thing. It ends in additional trips to the grocery store to replace whatever entire packages he has eaten. Plus, he couldn't smell as bad as Reggie’s feet. Ed, Tank, and I spread out in the last empty row in the gym and texted Lad where to find us. I said hello to Andrea (who greeted me in her typical creepy fashion), but I quickly pretended to be absorbed in the text I was sending Lad. Earth shattering stuff. 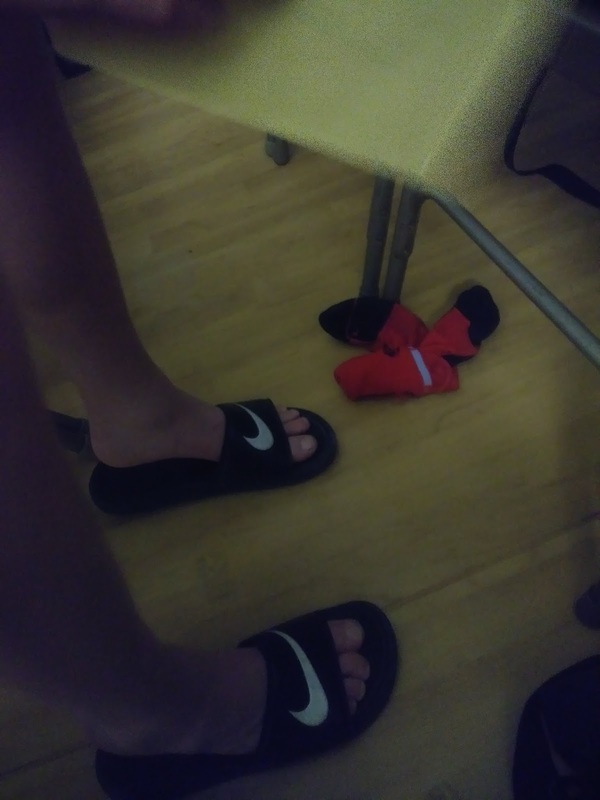 As only a 12 year old boy who is obsessed with cool sweat socks could do, Reg opted to put the same God-awful smelling socks back on his clean feet AFTER his mandated shower. This was a new low for our fam. I ordered him to take off the socks. IMMEDIATELY. ‘Ball them up and stick them under an empty chair. Who does this? What were you thinking?’ He didn’t really have a response. We were lucky that we had already banished ourselves unwittingly to the back corner - where we could only irritate Andrea and her people. I don't think it is possible to offend her. a whiff of them thru the picture. It was agony. Recently another 'cool' red and black basketball sock went thru the laundry with a hole in the toe. To deal with the unfortunate hole-in-toe ordeal, Reg wore another sock under the damaged one. I know this because that is how it came thru the laundry. Anything to prolong the life of a beloved sock. I guess. No one gets as excited about socks in his Christmas stocking as Reggie. The show was unique/cute. Curly did a great job as the emcee to this fake music game show. Famous composers decked out in white wigs competed against an unstoppable contestant. They had to name music that, as chance would have it, they had composed. The 4th grade band kids, who have recently begun to participate in band, 'played' (and I use the term loosely) snippets of famous tunes that needed to be identified. The hesitations between pieces were so long that I thought perhaps they were struggling with technical difficulties. I was anxious for the show to end so we could escape the room with our smelly socks before being asked to leave. The four brothers laughed thru the entire production - not all of it was meant to be funny. My mom showed up just before show time. I strategically sat her on the side of me -opposite Mr. Smelly Feet. Afterward my mom snuck out, and I begged the boys to make a quick appearance in the classroom. Ed admitted to me that when Curly found out he was coming to the show she told him, ‘Oh no. The show isn’t that good and you are probably going to make fun of me afterwards.’ I suspect that was her mindset when we all filed into her classroom and she saw Tank was present and accounted for. ‘Why’d you bring Tank?’ She groaned. The life of the youngest. That is Tank's hand grabbing around Reggie's waist (Reg is wearing the b-ball shirt - shock). I got a great picture of all of the boys with Curly in her classroom. I am not sure yet if you can make out Reggie’s stinky wad of socks shoved in the waistband of his shorts. Your life is thankfully never dull as if makes for great blog reading for me!!! Ha! I considered naming my blog 'never dull' - so true! Glad you enjoy it!